2019-04-21: Episode 53: I’m Talkin. . .Easter He is risen indeed. Open your mind to the fulfilled promises of God. 2019-04-20: My wife purchased a new 2019 Elantra today. Apple Car Play does not disappoint. I like the color. 2019-04-14: Episode 52: I’m Talkin. . .Annual Celebrate annual accomplishments. I forgot to mention that I also read through the Bible annually. 2019-04-07: Episode 51: I’m Talkin. . .Expectations When setting expectations be careful, be generous, be kind. 2019-04-06: When you go to the Dagget Days parade this is the main attraction. 2019-03-31: My bracket is busted but I still won my family’s pool. 2019-03-31: Episode 50: I’m Talkin. . .Show Time My $0.02 on the latest Apple Event. 2019-03-30: My nephew got married today. Nice to be a part of the day. 2019-03-29: We made the Home Chef meal for lunch today. Korean Pork Noodle Bowl. Pretty tasty. 2019-03-28: Framing Day Today we framed and put in the new window and re-purposed slider. 2019-03-27: Concrete Work Spent some time helping pour concrete to close in the back porch at my father-in-law’s house. 2019-03-27: Last night’s Home Chef meal: Chicken Adobo Flautas. Very good. 2019-03-25: Found these flowers growing at random on our property. 2019-03-24: Episode 49: I’m Talkin. . .March Madness We interrupt this microcast to talk sports. 2019-03-17: Episode 48: I’m Talkin. . .Joy Circumstance should not dictate joy. 2019-03-12: We made our Italian Sausage Wedding pasta for a second time. It turned out great. 2019-03-12: This is the wheat that has started to grow in the field I prepped a month back. Only about 3” tall. 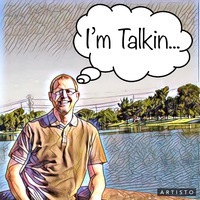 2019-03-10: Episode 47: I’m Talkin. . .Fear I’m not sure I did the subject justice but maybe it will spark conversation. 2019-03-05: Tonight’s Home Chef meal: Acapulco Beef Burger with fresh pico de gallo and cilantro-lime fries. 2019-03-03: Episode 46: I’m Talkin. . .Diet Defined by what we eat and can have a positive impact on quality of life. 2019-02-28: Tonight’s Home Chef meal was Sweet Chili Pork Lettuce Wraps. Spicy but very good. 2019-02-28: My tractor work is starting to show results. 2019-02-26: Tonight’s Home Chef meal: Italian Pork Wedding Pasta with Swiss card and tomatoes. So tasty. 2019-02-26: Finally got around to making an “on-this-day” page for my micro.blog. 2019-02-24: Episode 45: I’m Talkin. . .Wedding Weddings are just a microcosm of marriage. 2019-02-21: Snow fell in the Southern California desert this morning. 2019-02-18: The Mojave river was frozen this morning. 2019-02-17: Episode 44: I’m Talkin. . .Memories Recount and create. Both are important. 2019-02-16: Flowing Mojave River The Mojave river was flowing, above ground, this weekend. 2019-02-16: This is one of her cutest poses. 2019-02-14: Living on well water can be a struggle when the pump fails and it takes close to two days for a fix. 2019-02-10: Episode 43: I’m Talkin. . .Cards Metaphysical?? 2019-02-05: My helper today worked too hard, apparently. 2019-02-04: My granddaughter assisted with the tractor work this morning. 2019-02-03: Episode 42: I’m Talkin. . .Lazy Sometimes hard work is necessary but sometimes it isn’t. 2019-01-31: Getting ice cream with my daughter and granddaughter. 2019-01-27: My wife’s talent astounds. Cookies for my niece’s Bridal Shower. 2019-01-27: Episode 41: I’m Talkin. . .Music Music soothes the soul and much more. 2019-01-25: Yesterday my granddaughter dressed herself to go to the park. So cute. 2019-01-25: Today was ”disc the field” day on the farm. 2019-01-22: Tonight’s Home Chef meal: Mojito Rubbed Bone-In Skin-On Chicken with creamy elotes gratin. So good. 2019-01-20: Episode 40: I’m Talkin. . .Different It’s great to be different. Try it and see. 2019-01-15: My office for the next few days. 2019-01-15: Tonight’s Home Chef meal: Huli Huli Chicken Rice Bowl. Very tasty. 2019-01-13: Episode 39: I’m Talkin. . .Maturity I think maturity forms in different areas of our lives and should be a goal we desire. 2019-01-12: Yesterday we made Home Chef’s Weekday Sausage Lasagna. It was so good. 2019-01-12: Spent hours on the road and hours watching basketball and had a great day. 2019-01-11: The desert can be beautiful. 2019-01-07: Started with new walking shoes today. My last pair went 303 days for almost 1,100 miles. 2019-01-06: Episode 38: I’m Talkin. . .Frustration I don’t like being frustrated and am trying to learn to manage that emotion in a mature manner. 2018-12-30: Episode 37: I’m Talkin. . .Resolution It is that time of year but I don’t really like New Year’s Resolutions. 2018-12-29: After 24 hours on the tractor, over the past 4 days, I still only completed about 80% of the field. 2018-12-28: Continue working the field for my friend. From inside the tractor cab. 2018-12-26: Tonight’s Home Chef meal: Al Pastor Pork Flautas with pineapple and queso fresco. Very tasty. 2018-12-26: Helping my friend prepare a field for future planting. 2018-12-24: Today and tomorrow is all about family and celebrating the birth of Jesus. So grateful. 2018-12-23: Episode 36: I’m Talkin. . .Christmas What does Christmas mean? 2018-12-16: Episode 35: I’m Talkin. . .Teachable Do you have a teachable spirit or attitude when it is required? 2018-12-09: A little cold and foggy on my morning walk. 2018-12-09: Episode 34: I’m Talkin. . .Offended I think we can all turn our sensitivity meter down a notch or two. 2018-12-08: Days to Christmas countdown construction paper rings my granddaughter uses. So cute. 2018-12-08: Cold and frozen in Southern California this morning. 2018-12-07: Tonight’s Home Chef meal: Mesquite Chicken with loaded potato wedges. Very good. 2018-12-04: Home Chef delivered once again with Steak Quesadilla with Poblano/Corn salsa and Ranch. Very tasty. 2018-12-02: Episode 33: I’m Talkin. . .Sports Sports and the competition that accompanies can be used to build character. 2018-11-27: Home Chef delivered once again. Steak with a white wine demi-glaze with garlic herb potatoes. 2018-11-25: Episode 32: I’m Talkin. . .Thanksgiving We could all be a little more thankful. 2018-11-23: Lazy Friday with daughter and granddaughter. Pretty cute. 2018-11-22: We were able to celebrate Thanksgiving with a small part of our family. A good time. 2018-11-21: Helping Grandma make homemade noodles. 2018-11-21: Last night’s Home Chef meal: Mongolian Beef Tacos with Bok Choy slaw. Very tasty. 2018-11-18: Episode 31: I’m Talkin. . .Salesmanship Not a strength but maybe a necessity. Enjoy. 2018-11-13: Tonight’s Home Chef: Adobo Chicken Tostadas with refried red lentils. Super delicious. 2018-11-11: Episode 30: I’m Talkin. . .Crying I give you permission to have a good cry. 2018-11-10: Tonight’s Home Chef: Nacho Burger with seasoned fries. Simple and delicious. 2018-11-07: Tonight’s Home Chef: Nashville Hot Chicken Strips with remoulade slaw. So tasty. 2018-11-06: Just to make it official. 2018-11-04: Nice Mojave desert sunset. 2018-11-03: My friend owns a dairy in California. My son took some great photos with his drone. 2018-11-02: Home Chef delivers once again. Steak Strip Chimichangas with pico de gallo. 2018-11-01: My field work brought me into contact with this hawk. He wouldn’t let me get very close. 2018-10-30: My granddaughter spent a few days. We spent time working at the dairy together. 2018-10-30: Tonight’s Home Chef: Teriyaki Chicken with Roasted Almonds and Green Beans. So good!! 2018-10-26: Granddaughter weekend begins. I think she likes me. 2018-10-24: Steak with Rosemary Cream and cheddar mashed potatoes. Another Home Chef success. 2018-10-23: Pretty sunset last evening. 2018-10-21: Episode 27: I’m Talkin. . .Networking I’m not a people person but I’m trying to improve as it is necessary for my success. 2018-10-20: Another great meal. Steak Strip Marsala Risitto with Parmesan and mushrooms. 2018-10-14: Episode 26: I’m Talkin. . .Doubt I doubt I did the topic justice but I hope it’s a starting point for further conversation. 2018-10-13: Tonight’s Home Chef meal was Parmesan crusted chicken with mashed potatoes. 2018-10-13: 2018 Barstow Car Show Fun cars at the show this morning. A little overcast so that was nice. 2018-10-12: Cloud cover this morning makes for great sunrise pictures. 2018-10-07: Peyton’s 2nd Birthday Success and fun as we celebrate Peyton turning 2 years old. 2018-10-07: Episode 25: I’m Talkin. . .Grandchild Grandchildren are a blessing from God. There is special audio in this episode. 2018-09-30: Episode 24: I’m Talkin. . .Patience Patience, love, wisdom, humility. Sounds like someone I would like to have as a friend. 2018-09-28: Nice early morning sun on my friend, the hawk, during my morning walk. 2018-09-23: Episode 23: I’m Talkin. . .Family The family unit is important and an interesting dynamic. 2018-09-22: There were a few of these birds by my house that I saw during my morning walk. Vultures? 2018-09-16: Episode 22: I’m Talkin. . .Gather Round My 12 minute take on the Apple Event from September 12th. 2018-09-14: Took the afternoon off to drive a couple hours to visit the granddaughter. Always a great time. 2018-09-11: Early morning walks help me with my photography. 2018-09-09: Episode 21: I’m Talkin. . .Knowledge What we do with the knowledge we obtain is as important as obtaining. 2018-09-03: Desert Lighthouse A few pictures of a lighthouse located in the Mojave Desert. 2018-09-02: Episode 20: I’m Talkin. . .Secrets Are we worthy of being told secrets? We can be. 2018-09-01: Home Chef has proven to be a nice addition to our meal repertoire. 2018-08-31: We experienced a beautiful sky last evening. 2018-08-27: We took a little trip into the desert to see a lighthouse. Strange to see in the desert. 2018-08-26: My daughter’s dogs that live with her parents. They miss her. 2018-08-26: Episode 19: I’m Talkin. . .Disagree You may and that is your right. 2018-08-19: Episode 18: I’m Talkin. . .Courage When the child teaches the parent to be courageous in uncertainty. 2018-08-16: Beautiful sky this evening. 2018-08-12: Episode 17: I’m Talkin. . .Laughter Let’s lighten things up a little and laugh. 2018-08-10: A little artistic tractor tire track between the Sudan grass. 2018-08-08: When California is on fire this is the sun you get. 2018-08-05: Episode 16: I’m Talkin. . .Starting Starting can be difficult. Perhaps this microcast will encourage the beginning of something new. 2018-07-29: Episode 15: I’m Talkin. . .Emulation We need to be aware and take the responsibility seriously that someone may be emulating us. 2018-07-26: Early morning walk. Small hours of the day that are under triple digits. 2018-07-22: Episode 14: I’m Talkin. . .God Credit What if a celebrity athlete sold out for God in their award acceptance speech? 2018-07-20: I am thinking of making the leap into the self-employment arena. A little frightened. 2018-07-16: Pretty sky last evening. 2018-07-13: Looking at cordless mowers. They look like race cars. 2018-07-12: Rain and sun simultaneously. Beautiful. 2018-07-10: Living in the high dessert of Southern California the smell of approaching rain is awesome. 2018-07-10: Job searches can be difficult. Putting down in words my current situation was therapeutic. 2018-07-07: Look who came to visit for the weekend. 2018-07-01: My wife is at it again. Great pineapple rice with teriyaki chicken in a pineapple bowl. 2018-06-27: iOS 12 beta and new iPhone X happened yesterday. So far so good. Not ready to share my memoji yet. 2018-06-26: My wife makes the best salads. 2018-06-24: I think they are pigeons but not sure. 2018-06-18: A new born calf just before I walked by this morning. Hello world!! 2018-06-15: I hope she isn’t losing circulation. She has me wrapped tight around her little finger. 2018-06-15: Duffy Boat Ride Our daughter purchased a Duffy boat ride for the family. Great fun. 2018-06-10: Episode 8: I’m Talkin. . .WWDC 2018 My quick thoughts on the WWDC 2018 Keynote. 2018-06-08: I think she loves her G-Pa.
2018-06-06: Whew!! Looks like my mid-2012 MacBook Pro just made the Mojave cut. 2018-06-05: I also found the WWDC 2018 opening video to be one of Apple’s best. So true and so funny. 2018-06-03: Episode 7: I’m Talkin. . .Creativity Let’s use all parts of our brain and be creative in different ways. 2018-06-02: Fruit trees are producing. 2018-06-02: Spent a little time hanging with my granddaughter for my son’s birthday. 2018-05-29: I was reminded of working with my Papa about 40 years past. 2018-05-28: Why would any person live in the absence of anticipation? 2018-05-27: Episode 6: I’m Talkin. . .Process This week I discuss process and metrics. My professional wheel house. 2018-05-23: Our church youth choir entertaining during Wednesday church dinner. 2018-05-16: Wheat Field My neighbor’s wheat field. 2018-05-13: Episode 4: I’m Talkin. . .Mom This week I honor 4 mom’s who are very special people in my life. 2018-05-12: She is the cutest. 2018-05-11: I was out for my walk early this morning. 2018-05-10: Spent part of the day working in the field for my dairy farmer friend. A little too much sun. 2018-05-09: I like the Icro App. Congrats @hartlco. Don’t know why the mention doesn’t link. 2018-05-09: I have been enjoying @mnmltek Microcast. Just thought it worth a mention. 2018-05-05: Ran into an old friend in the middle of nowhere (some pronounce it Yermo). We were both surprised. 2018-04-27: Sometimes attitude makes all the difference. 2018-04-24: My friend owns the Hinkley Dairy and allowed me to take some pictures. 2018-04-23: Took a few pictures of my friend’s dairy this evening. More pictures will follow. 2018-04-19: My neighbor watering the field while I am on my morning walk. 2018-04-19: This is what happens when the wife is using FaceTime with the granddaughter and cooking bacon. 2018-04-17: Spent a little time thinking about Biblical History this week. 2018-04-13: I am constantly amazed by God’s Free Gift. 2018-04-10: More ramblings from the uninformed. This time I tackle Apple’s Cloud Services. 2018-04-01: Awesome weekend with family and my favorite little girl (granddaughter). 2018-03-30: My iPhone doesn’t do this morning’s moon full justice. 2018-03-30: Good Friday is the day my Savior sacrificed Himself so I can live. 2018-03-29: Out early for my walk once again. This was my view at the end of my walk. 2018-03-28: More ramblings from the uninformed about Apple and Education. My second attempt. 2018-03-27: I, for one, was quite impressed with Apple’s education event. Longer form post to follow. 2018-03-26: Went to my mom’s for dinner. Apparently I’m not the only one that likes her food. 2018-03-24: Up and at it early. 2018-03-21: Morning Walk Foggy morning as I head out for my walk. Half-way and the sun started rising over the horizon. 2018-03-21: Lonely chicken in the rain. 2018-03-21: It is raining here so binging on Jessica Jones. 2018-03-14: Morning sun on my morning walk. 2018-03-12: A little fog during my morning walk. 2018-03-11: Granddaughter smiles warms hearts. 2018-03-11: A visit by your granddaughter makes for happy hours. 2018-03-07: Sometimes early morning walks are rewarded. 2018-02-25: Picking up my camera again after a long hiatus. © Copyright 2019 I'm Talkin. . .. Follow @joelmearig on Micro.blog.